Is Rafsanjani Up To Something? Today the Iranian government arrested Ayatollah Rafsanjani’s daughter Faeze. And after her arrest, instead of staying put in the UK, his son Mehdi who is wanted in Iran went back there! Surely his father Ali Akbar Hashemi Rafsanjani would have told him not to come back and to stay put in the UK instead. It seems that he didn’t. And why have we not heard a strong reaction from Rafsanjani condemning the arrest of his daughter? 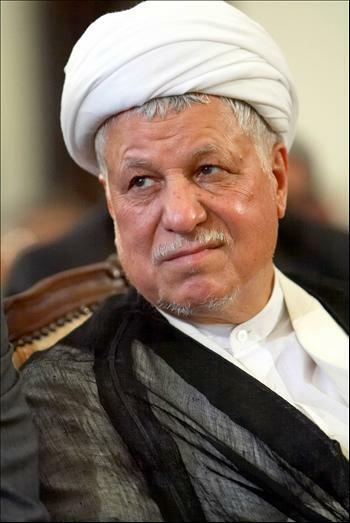 1 – Rafsanjani has decided to sell his children out. 2- He has cut a deal with Khamenei according to which his children are quickly arrested and then released, and in return Rafsanjani is given part of his power and influence back by Khamenei. The second one is a possibility that can’t be ignored. The arrest of Rafsanjani’s children, even if they are temporary could be used as a tool by Khamenei to please those within the regime who have been calling for the arrests of Rafsanjani’s son and daughter. Faeze Rafsanjani who was arrested today went to London to visit her brother Mehdi during the Olympics. Did she tell him about these upcoming events and coordinate this whole saga with him? Did her father send her there for this purpose after consulting with Khamenei? Maybe. Once this story is over and Rafsanjani has “paid his fine” his return to the fold could be easier, so goes this theory. The thing with Iranian politics is that you never quite know. There is always another surprise around the corner. But could Rafsanjani be so weak and cowardly to sell his own children out?